Australian engineers at the University of New South Wales (UNSW) have edged closer to the theoretical limits of sunlight to electricity conversion by photovoltaic solar cells with a device that sets a new world efficiency record. The new solar cell configuration developed by the engineers has pushed sunlight to electricity conversion efficiency up to 34.5% – establishing a new world record for unfocused sunlight and nudging closer to the theoretical limits for such a device. A 2-D diagram of how the prism spectrum splitter mini-module works. Image Credit: Rob Largent at UNSW. Click image for the largest view. 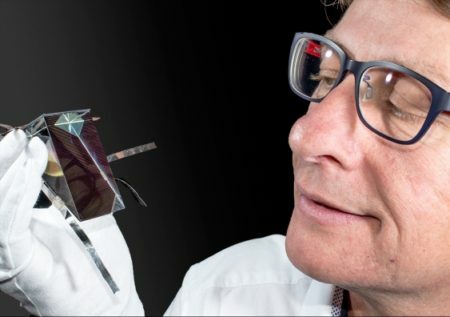 The record was set by Dr. Mark Keevers and Professor Martin Green, Senior Research Fellow and Director, respectively, of UNSW’s Australian Centre for Advanced Photovoltaics, using a 28-cm2 four-junction mini-module – embedded in a prism – that extracts the maximum energy from sunlight. It does this by splitting the incoming rays into four bands, using a hybrid four-junction receiver to extract even more electricity from each beam of sunlight. The new UNSW result, confirmed by the US National Renewable Energy Laboratory, is almost 44% better than the previous record – made by Alta Devices of the USA, which reached 24% efficiency, but over a larger surface area of 800 cm2. Dr. Mark Keevers with one of the spectrum splitting, four-junction mini-modules developed at UNSW. Image Credit: UNSW. Click image for the largest view. The 34.5% result with the 28-cm2 mini-module is already a world record, but scaling it up to a larger 800 cm2 – thereby leaping beyond Alta Devices’ 24% – is well within reach. “There’ll be some marginal loss from interconnection in the scale-up, but we are so far ahead that it’s entirely feasible,” Keevers said. The theoretical limit for such a four-junction device is thought to be 53%, which puts the UNSW result two-thirds of the way there. 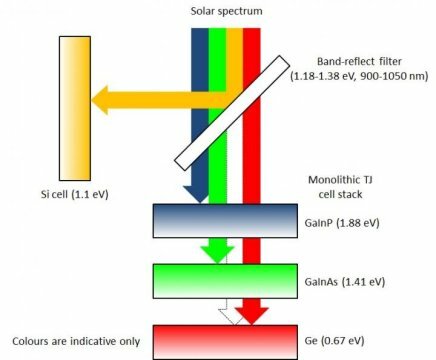 But the spectrum-splitting approach is perfect for solar towers, like those being developed by Australia’s RayGen Resources, which use mirrors to concentrate sunlight which is then converted directly into electricity. The Aussies deserve a lot of credit for their solar achievements. Its also a top of the line press release. A little chest pounding is appropriate. Rah, rah Australia!